Movie speculation drive comic prices nowadays. Love it or hate it, it is currently part of the investment climate and is something we need to play along if we want to make money with our comics buying and selling. Now, with many movies have already been announced, there seems to be a belief in the community that there is no longer any undervalued comics. I don’t believe that is true at all. Sure, the obvious keys are gone but there are still a number of books that are still under the radar. I have already highlighted a number of them on this blog such as Wonder Woman #9, Green Lantern #59 etc. In this article, I am going to do a simple summary that lists out the potential undervalued keys according to each movie. 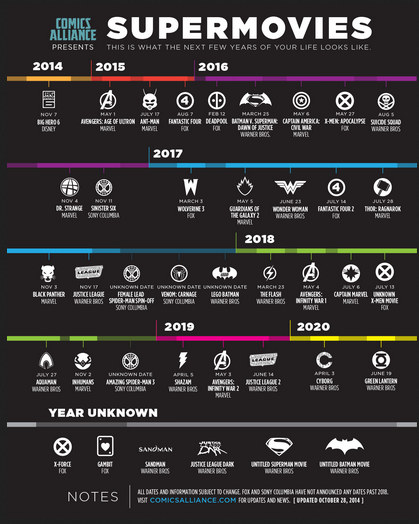 I am starting with comic book movies for 2017 because I believe 2016 is already very saturated with speculation. Most folks can only see 1 year out in advance so I believe there are still gems out there from 2017 onwards. Keys that are obvious are omitted from the list below. This is a relatively fairer bet among the 2 options. However, you need to be selective here. Not all supporting character or villains can experience good price hikes. Nebula, Lady Sif, Collector etc are all examples of bad investments. Good examples included in the list above are strong supporting characters/villains like Mera, Adam Warlock, Magnus, Darkseld etc. Looking through the list above, there are a still a couple of missing blanks when it comes to the supporting cast and villains. GOTG #2 for example doesn’t have a clear view on who can be its main villain. Similarly, we have no clue on which supporting characters can appear in the Captain Marvel movie. Spider Man is a total mystery. All these represents buying opportunities when further news is available. In terms of growth potential, this second option tends to have better returns, which is to be expected given the higher risk. Why? Most collectors are fairly reactive so they will only start buying when news are confirmed. Hence, early birds do get the worms in this case. To reduce the risk, I suggest focusing on really strong characters who have been used fairly extensive in the comics. Characters such as the Red Hood, Sandman, Death, Swamp Thing etc are no brainers. You should get have these in your collection before any movie confirmation happens. One thing to note is that not all undervalued issues equal to cheap buying opportunities. I measured undervalued relative to where they can appreciate to. Showcase #37 for example is not a cheap book but I expect its prices to increase at least 2 to 3 times further if they were to appear in the Cyborg movie. I have put cash where my mouth is and have already hoarded most of the issues mentioned above. If you are looking for undervalued comics related to movie speculation, this list should be a good start.